Televisionista: Steven Weber Joins "Desperate Housewives"
Steven Weber Joins "Desperate Housewives"
Steven Weber ("Wings," "Studio 60 on the Sunset Strip), who romanced Rachel Griffiths on ABC's Sunday night dramedy "Brothers & Sisters" last season is coming back to the same network and night this year, but he will now be seen an hour earlier raising eyebrows with a young lady on Wisteria Lane. 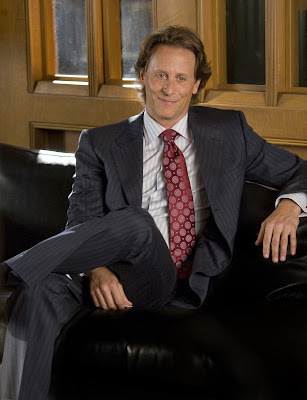 According to EW's Ausiello: "When Susan Mayer's (Teri Hatcher) now-adult daughter Julie (Andrea Bowen) returns to Wisteria Lane next month, she'll be bringing along one helluva surprise: boyfriend Steven Weber." The show producers have cast Weber as Julie's thrice-divorced college professor-turned-lover, whose sudden appearance leads Susan to double her crazy pill intake. The actor (and former "Desperate Housewives" regular Bowen) will only appear in one episode so far.